New Starting Point Trading Co., Ltd. Black Forged Steel Burly Heavy Duty high Strength Steel Camping Tent pegs Stake for Outdoor Pack of 12 by New Starting Point Trading Co., Ltd. at Kerinci. MPN: Y-X007. Hurry! Limited time offer. Offer valid only while supplies last. Each one is 8-inch length and 0.4-inch diameter. The tent stakes made of forged steel. Long and heavy enough to stand against the wind. 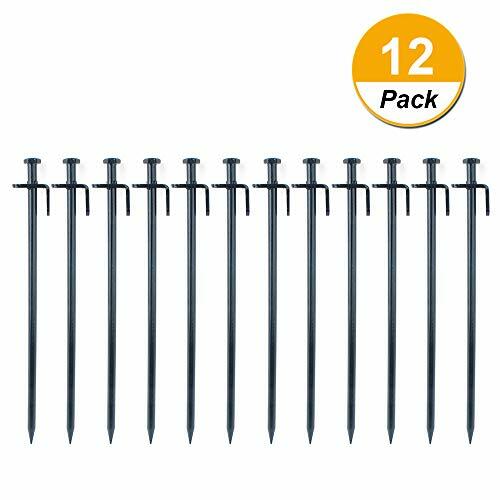 These camping stakes are designed with a large flat head and smooth sharp end for driving into the ground easily,the hook design that is effect to prevent the tarp stakes from going too deep,it's also to prevent the rope slipping. the hole in the head of the stake is used for pulling the stake out of the ground. Tent stakes are suitable for nailing tents, canopies, tarps, and etc. to the ground. perfect for outdoors camping and backpacking. long and large tent stakes make sure your camping trip safe in the tents. Manufacturer: New Starting Point Trading Co., Ltd. Brand: New Starting Point Trading Co., Ltd. Publisher: New Starting Point Trading Co., Ltd. Studio: New Starting Point Trading Co., Ltd. If you have any questions about this product by New Starting Point Trading Co., Ltd., contact us by completing and submitting the form below. If you are looking for a specif part number, please include it with your message.